See pictures of our sugar house and historical photographs of the Dufresne family over the 100+ years we’ve been boiling maple sap into delicious syrup, cream, and candy. Sap harvesting and boiling depends on the weather, of course, but the season usually runs from mid-February through early April. Learn how to find us, when we’re making syrup, and how to make an appointment to visit. We wait until the nights are below freezing and the days are mild, announcing the arrival of “sugaring weather.” When the moment arrives the maple sap begins to flow and we tap our trees. At Dufresne’s Sugar House we collect the maple sap using a tubing system we install and maintain year-round. Just before the arrival of sugaring weather … we take a last anxious walk along the tubing lines looking for damage by the bears that roam our mountains. During the 4-6 week sugaring season … we collect maple sap and run the Dufresne Sugar House non-stop with 24-hour days a frequent visitor (this year my wife insisted on four hours of sleep a day with a request that next year it increases to five). Once the maple sap is collected … we immediately bring it to the sugar house. Maple sap must be evaporated as soon as possible to make the freshest and best quality maple syrup and candy! 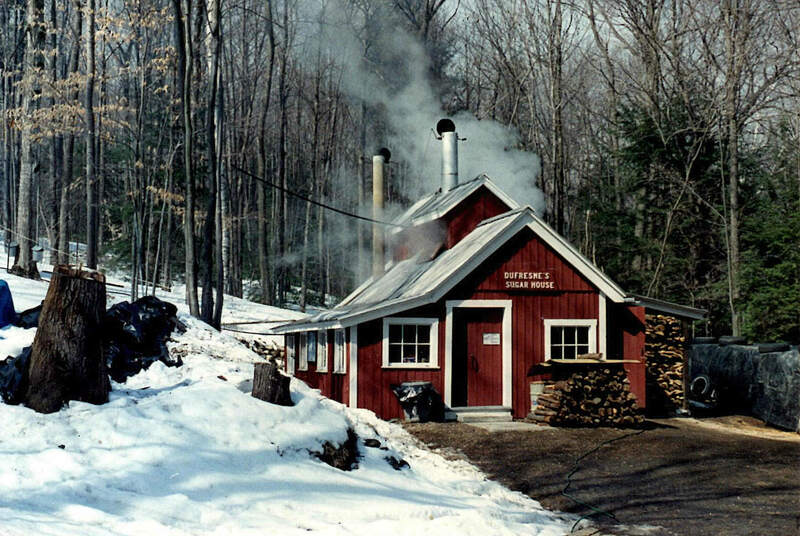 The special evaporator … we use at the sugar house to boil down the maple sap is heated using only locally harvested and seasoned wood. It takes about one cord of wood to boil down 800 gallons of sap, evaporating the water to create between 40-80 quarts of pure maple syrup. More art than science … we watch as the sap boils into a golden color as we monitor the temperature until it reaches seven and a half degrees above the boiling point of water. Now the sap has reached its proper density and has become maple syrup! Coming from the tree … the maple sap entered the evaporator as 98-99% water and 1-2% sugar. Leaving the evaporator maple syrup is 67% sugar and only 33% water. We finish by filtering the maple syrup and bottling it for our kitchen table with a little left over to be delivered to your home. Although the “sugaring season” is very short, “Sugaring” is a full time job, which fills the whole year. We have grown to setting about 6,000 taps and making about 1,000 gallons of syrup per year. Maintaining the Collection System – We are in the process of switching from flexible tubing, which must be set and removed each year, to rigid tubing, which stays in the woods year round and is cleaned in place using a pressurized water system. Even with the permanent tubing system, each of those 6,000 taps has to be handled at least three times per season. The tap hole has to be drilled and the spout inserted. At cleaning time, each spout is pulled out and water is run through it. Then each drop line and spout has to be drained of water and plugged up. Cutting Wood & Maintaining Equipment – We burn between 40 and 60 cords of wood per season to boil the sap. One man can process about two cords of wood per day, if he works diligently all day, so you can get an idea of how much work goes into just putting up the necessary wood. In addition to cutting wood to burn, there is forest upkeep. Dead trees must be removed. Bear and squirrel damage to the tubing system must be repaired. Brush must be kept down in order to make it possible to walk from tree to tree. There is a lot of equipment required for this job, including an evaporator, the tubing, a tractor, a truck, a four-wheeler and a snowmobile. The latter two are for getting around in the woods where a tractor or truck cannot go. All of this equipment must be maintained.